Glaucoma is a painful condition of the eye resulting from increased pressure within the fluid filled chambers of the eye. This will cause irreversible blindness if left untreated. Glaucoma, whether primary (inherited) or secondary (as a result of other disease), is a condition that is controlled not cured. Treatments may include surgery and/or medications that lower the pressures in the eye. We have the ability to test and monitor your dog or cat's eyes for excess pressure in a matter of minutes (tonometry) using our Tonopen instrument. 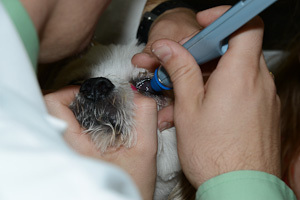 This quick, painless procedure tells us if the pressures in your pet's eyes are normal or elevated.